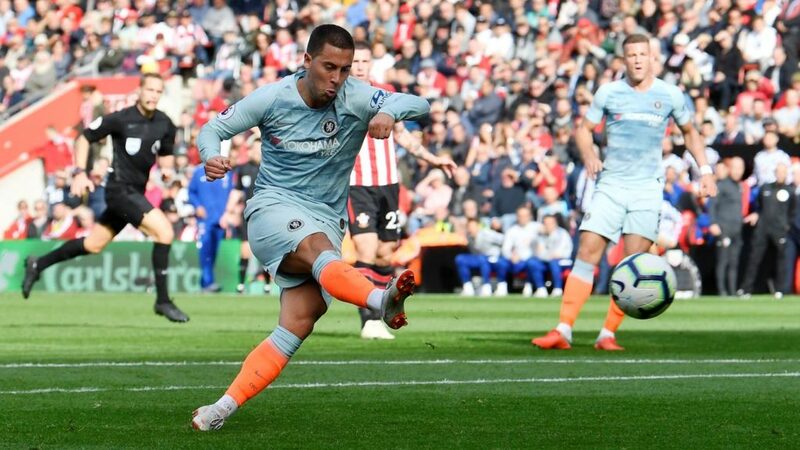 Eden Hazard continued his fine form as Chelsea claimed a comfortable 3-0 victory over Southampton to maintain their unbeaten run in the Premier League. The Blues are a rejuvenated side under Maurizio Sarri and two men inspired by the new manager this term were influential on Sunday, with Ross Barkley creating Eden Hazard’s opener and netting the second himself to open his account for the club, before the Belgium star teed up a third for Alvaro Morata. Barkley was on the very fringes of Antonio Conte’s Chelsea team, in which the system shackled star performer Hazard, but the pair are thriving now and combined to devastating effect at St Mary’s. Although Southampton had chances to make the three points a trickier conquest for the visitors, Sarri’s men were deserving winners as they sent a message to their closest title rivals, who face each other at Anfield later in the day. Desperate early attempts to crowd out Hazard saw a loose ball break to Willian for a deflected shot that looped onto the crossbar, before Southampton belatedly responded and Danny Ings somehow volleyed over the top from four yards. Wesley Hoedt was fortunate not to concede a penalty as he slid into Olivier Giroud and the hosts’ luck then ran out when Barkley freed Hazard to calmly send the goalkeeper the wrong way. Another big Saints miss followed the restart as Ryan Bertrand lashed off target and they again paid the price, with the unmarked Barkley stabbing into the net from a misdirected Giroud scissor-kick. A late flurry saw Nathan Redmond rattle the crossbar and Morata then shoot straight at Alex McCarthy on the counter, before the Chelsea substitute made amends with a dinked finish in the third minute of stoppage time. Regardless of what would happen at Anfield later in the day, Chelsea ensured they would be Sunday’s big winners with victory here. If this is to be a three-way title tussle – it is increasingly looking that way – then the Blues could have asked for little more than an away win while at least one of City and Liverpool dropped points. A fifth league defeat of the season leaves Southampton still just two points above the bottom three, winless at home this term and with only six goals from eight top-flight outings. Hazard’s brilliance comes as no surprise, but Barkley’s might, given his tough start to life at Chelsea. The midfielder repaid Sarri’s faith in handing him a start at St Mary’s with an assist and a goal – his first for the club – but also an energetic display in which he roamed effectively, working impressively with and without the ball. With Southampton working so hard to keep the Chelsea attack out, concentration was key – and Hoedt had two lapses in the first half. The Netherlands international escaped punishment for his challenge on Giroud in the area but then saw Hazard capitalise on some lazy defending as he stepped out of defence and left Chelsea’s main man all alone. – Chelsea have won their last six Premier League games against Southampton, since losing 3-1 under Jose Mourinho in October 2015. – Barkley became the first Englishman to score and assist in a Premier League game for Chelsea since Frank Lampard in December 2013. – Since Mark Hughes’ first Premier League match in charge of Southampton in March, the Saints have lost nine Premier League games – only Newcastle have lost more (10). – There were 31 passes in the build-up to Morata’s 90th-minute goal for Chelsea – the most before a goal in the Premier League this season. – Hazard scored and assisted in a Premier League game for the first time since October 2016 – which was also at St Mary’s against Southampton. A trip to in-form Bournemouth is up next for Southampton after the international break, before a potentially pivotal game against fellow strugglers Newcastle United. Chelsea will have the opportunity to pile more misery on former boss Jose Mourinho when they return at home to Manchester United on 20 October.